I brought my scrappy hexie project along in our trip. I haven’t worked on this in a while so here is a picture to show you where I am at on it. It is getting a bit unwieldy for a travel project. I have 54 more hexies cut for this. I would like to have this done this year so I better get to work! 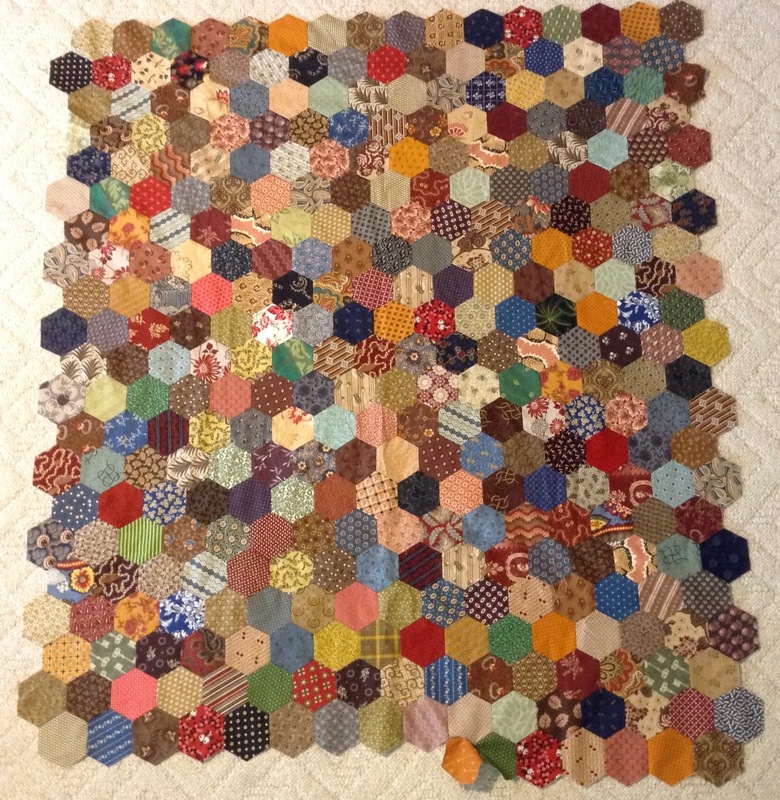 This entry was posted in Hand piecing, Hexagons, Scraps. Bookmark the permalink. Lots of fun scraps in your hexies. These are regular hand piecing but I am trying EPP on another project now. That’s a really good idea. I may have to try that. At this point, I have no idea! It’s delicious! Love these fabrics! Are these Civil War repro fabrics? Just lovely. Such a lovely combination and mix of colors in your hexie project. Love your hexies quilt, Katy. Hope you are enjoying your vacation. Your hexies are turning a wonderful quilt. Love the fabrics you chose. Happy Sunday! The hexies are lovely. Your quilt will be gorgeous. How will you be finishing the edge of the quilt? What a lovely mix of colors! I’m working on a hexie quilt too. To make it easier to take with me, I work on putting together smaller sections when I’m out and about and attach them to the main body when I am at home. I use a triple zipper pouch with a squared off bottom for my travel project bag and it fits perfectly in my purse so I always have it to whip out when I have a few spare minutes. I’m sure you will do it !! Love the variety of fabrics you are using! Do you EPP or hand piece them? Love those fabrics in your hexie quilt. Hexies make a wonderful travel project … I’ll be working on mine on our trip. 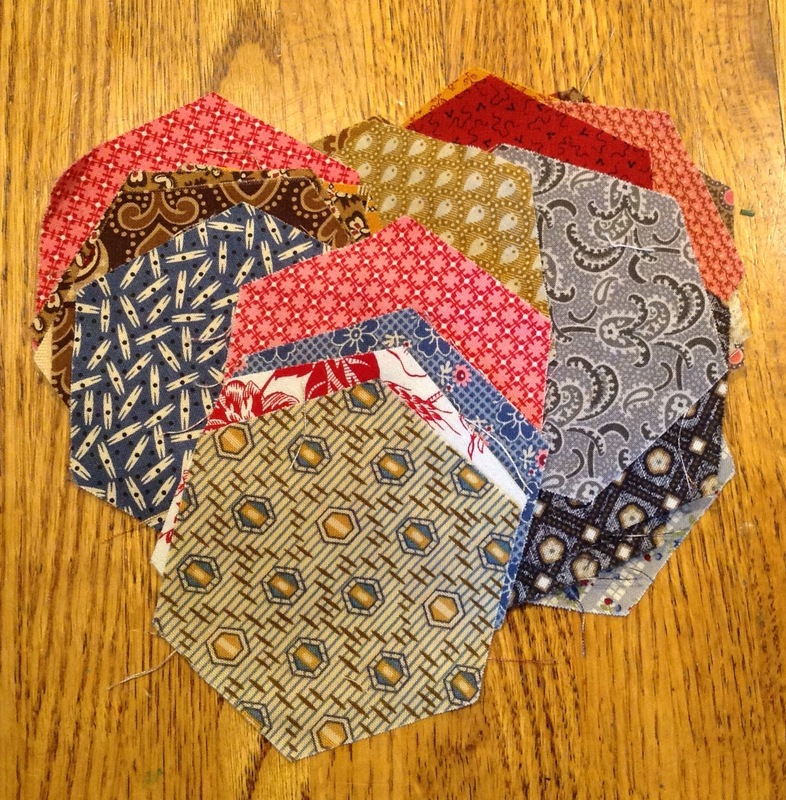 I have not started a hexie project, yet….our guild is having an EPP workshop this fall. Your project is coming along! Happy hexing to you!